Running Wild Podcast‘s Rich Laconi and Runz bring you another episode of wrestling discussion, sharing their thoughts on all the latest in the world of professional wrestling. Rich and Runz welcome guest Gerard Haskins for the show this week. The guys discuss NXT Takeover Brooklyn 2, WWE Summerslam 2016, ROH Death by Dishonor XIV and make predictions for Field of Honor too. Gerard and Runz share their insights being there live for NXT and SummerSlam. While Rich weighs in from a television viewer’s perspective. This extra long episode also features a special interview with “Bonesaw” Jessie Brooks and Kris Levin. 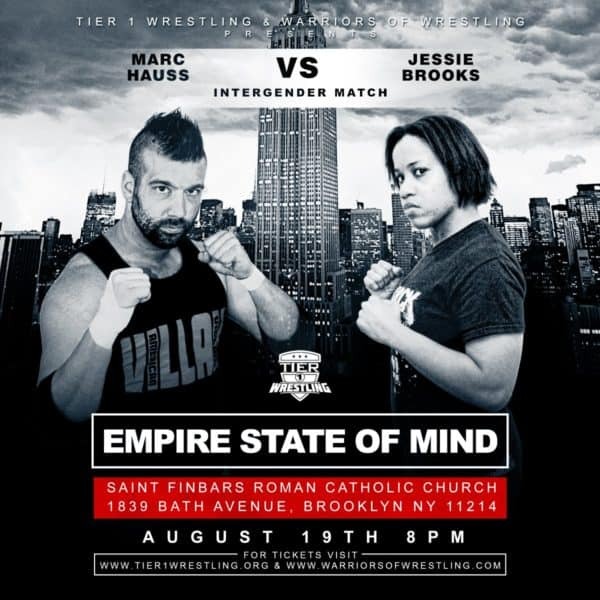 They participated in an Intergender match that was stopped by the New York State athletic commission at a Tier 1 Wrestling show. The two share their ideas about why the match was stopped. They also discuss how they were able to continue the match as the main event. Finally, they share about their careers up until this point and going forward. Two longtime friends Rich Laconi and Runz run wild on everything and anything professional wrestling each week. They might talk about their experiences at an indy show, discuss what happened on WWE RAW or Smackdown, NXT, Lucha Underground, or even ROH, EVOLVE, or anything that strikes their fancy.